Good morning everyone! Just wanted to let you know that the June new arrivals are now live on J.Crew. A few of my favorite items from the newest collection: here, here, here & here. Also, take 25% off anything from this section of the site. Happy summer shopping!! So happy for peony seasons!! Such gorgeous flowers :-) I love this look– it’s so chic and comfortable at the same time! Beautiful casual look. Love the flats! pretty and classy outfit, love it! LOVE this look! 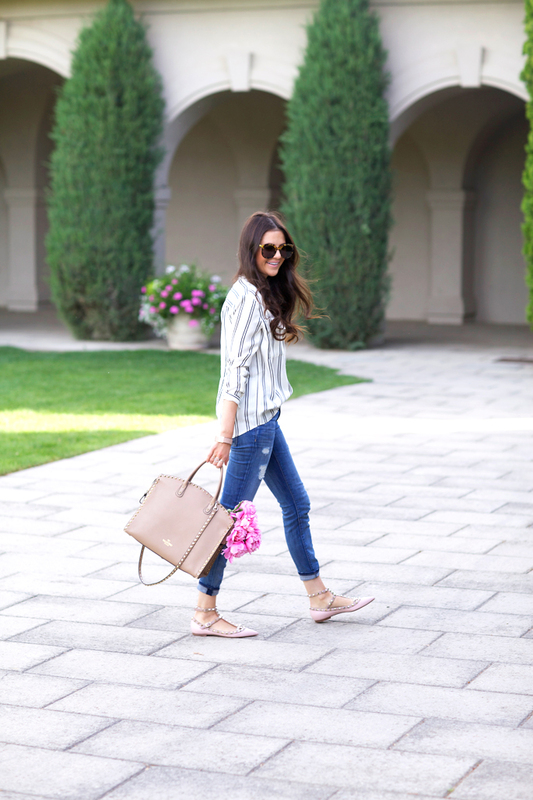 Those Valentino flats are gorgeous! I wish I had those shoes…..I see them everywhere but my wardrobe!! You look gorgeous! I love your jeans! I love this casual look! The studs really glam it up! Beautiful photos – love your gorgeous sunnies! So pretty!! Loving those shoes and bag! Loving that top and it’s on sale, which makes it even better!!!!!! You rock Valentino so well. Love this casual but very classy outfit! Love the new J.Crew pieces! And your look is darling! Flowers make a great accessory! The oversized sunnies are super cute! I love this casual look! Those flat rockstuds look fab on you and yay for peonies season!! I am so in love with that top, your lip color, and those peonies! too bad they don’t grow all year round. love this look! Love the outfit! And these peonis are absolutely gorgeous! I love this carefree, laid back look! 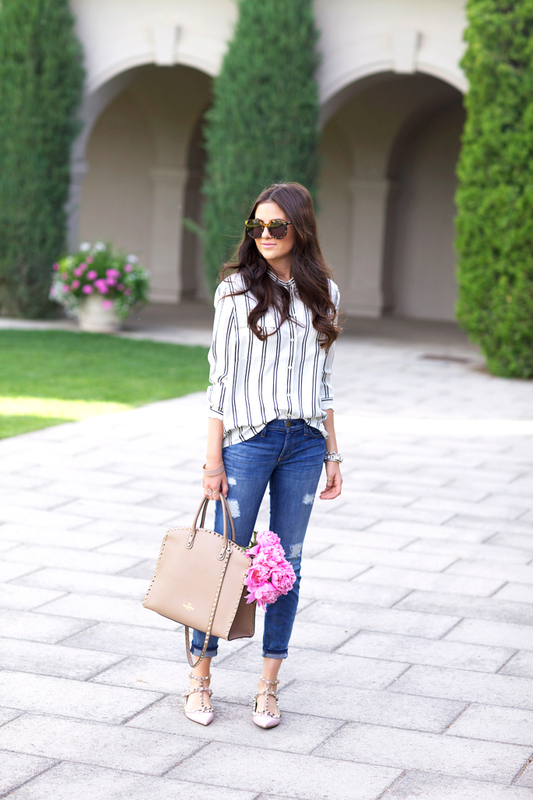 You can never go wrong with stripes! Love your matching bag and shoes and the flowers peeping out of your bag. So pretty. that top is so fantastic! Love this simple and classy look! Stunning J. Crew blouse! May have to buy this one! I love this striped shirt. Very polished and chic! Love your blouse. Fits you perfectly! I love this outfit! The pairing of stripes and leopard are defiantly a favorite! I love this outfit. Those jeans are amazing. Love the tiop! Really comfy look! And once again those shoes are everything! Lovely outfit! :) I’m excited for the new arrivals! Thanks for posting! Very cute outfit, I really like that top! It could easily be warn to work or dress down like you have it! I love that beautiful bunch of peonies in your bag!! Happy Weekend! I’m loving the vertical stripes on you, girl! So cute! Those Valentino flats are to die for ! Really love this look…pretty and chic!!! So pretty! Love that blouse! Love the top & those shoes are to die for! So pretty. chic and effortless. So darling! Those flats completely takes this ensemble to the next level! Chic honey! 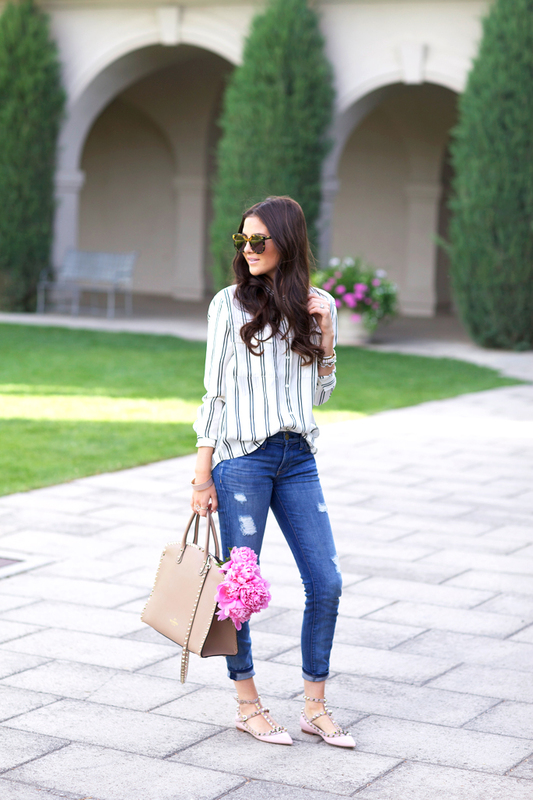 I love the relaxed denim in this look. Perfect for a weekend. You look lovely! Those Valentino flats are to die for! love it!! so pretty and stylish! Such a gorgeous outfit! 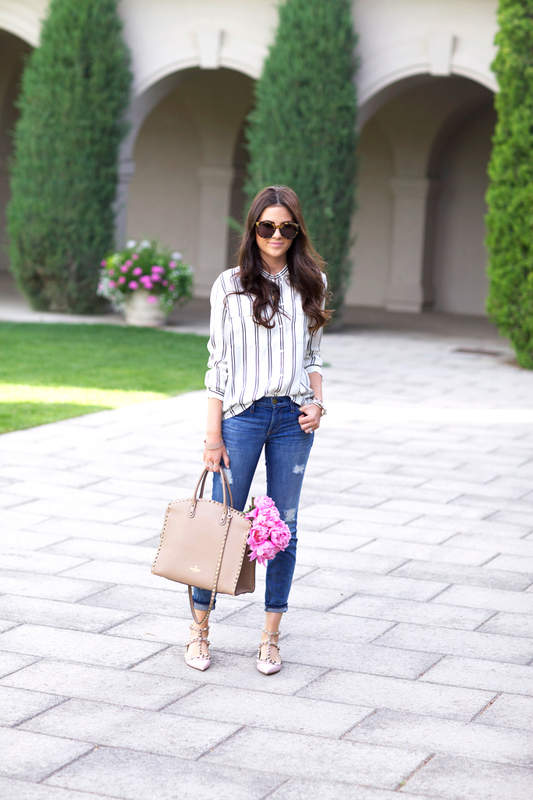 Casual and chic!